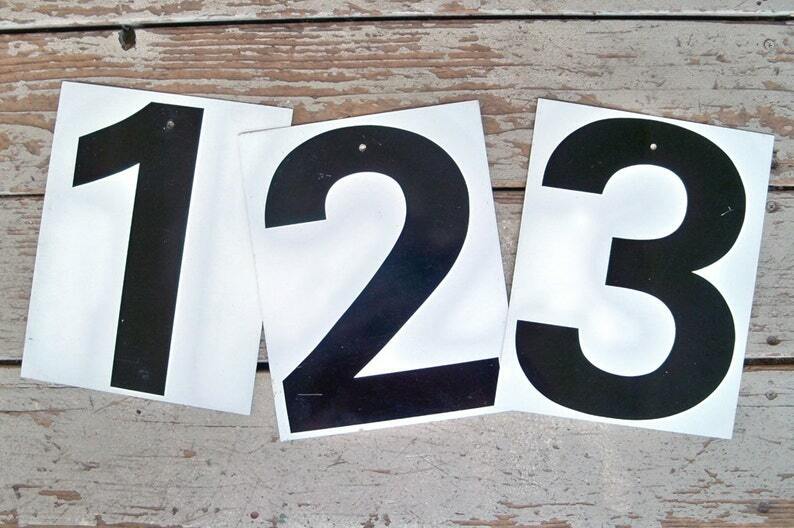 We love these fun industrial style numbers which were probably used for prices on retail signage circa 1960s-70s. They make great gifts--put together number combinations for a special date (birthdays, anniversaries, etc.) or to display your lucky number. They each measure 10" (25.5cm) tall and are 7 - 7/8" (20cm) wide and is made of sheet metal, painted white with bold black numbers. This listing is for one (1) number. They are printed on both sides with a different number on the back. Select which number combination/quantity you would like from the options available. The inventory is live and quantities are limited--no more available. These numbers are all in good vintage condition with some scuffs, light scratches, small dings but no major issues and bright, strong graphics. Each number has a hole drilled in the top (some have holes on bottom as well) for easy hanging. Flat $4.95 shipping to anywhere in the USA. International shipping rates as shown. Buy two or more and you'll automatically get free shipping on additional numbers. Industrial Metal Number - Red on White Metal, Address Numbers, Birthday, Anniversary, Wedding Numbers "Industrial Chic"
Mid Century Metal Toolbox "Nicely Distressed with lots of Industrial Chic Charm"
Mid-Century Union Metal Toolbox "Nicely Distressed with lots of Industrial Chic Charm"
Mid Century Industrial Metal File Box with Dividers "Nicely Distressed"